New Zealand has various communication channels with the DPRK. These include formal diplomatic ties and engagement through international processes. New Zealand’s Ambassador in Seoul is cross-accredited to the DPRK, while Foreign Affairs Minister Hon. 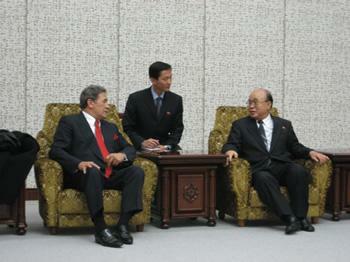 Winston Peters visited Pyongyang in November 2007. Here the DPRK expressed interest in closer relations,and areas of potential co-operation were covered. Commenting in December 2009, Patrick Rata (then Unit Head, New Zealand Ministry of Foreign Affairs and Trade Asia Division) said New Zealand diplomats were treated with respect by their DPRK counterparts during a May 2009 visit, and appreciated the opportunity to both visit the DPRK, and talk with leaders. They registered New Zealand’s concerns with the DPRK, such as over human rights. North Korea’s Embassy in Jakarta, Indonesia, is responsible for diplomatic relations with New Zealand. North Korean Ambassadors cross-accredited to New Zealand have visited three times since 2001, most recently in May 2007. However, a visit is scheduled for August 2012. From 1999 to early 2012 there were 15 official New Zealand visits to the DPRK, generally for credentials and accreditation. The most recent visit occurred in May 2011 where New Zealand again registered its concerns over North Korean actions. “North Korea Welcomes Winston Peters!” New Zealand Herald Cartoon, November 2007, National Library of New Zealand. Contentious issues significantly influence the bilateral relationship. Key obstacles to closer relations are North Korea’s human rights record, illegal activities along with its nuclear and missile tests. Rata noted in December 2009, “New Zealand supports the Six Party Talks and hopes that the DPRK will open up to the international community. It supports dialogue with the DPRK, its denuclearisation, progress in respect for human rights, and hopes the DPRK lives up to its international commitments”. Furthermore, “New Zealand seeks the DPRK to refrain from provocative acts such as nuclear and missile tests”, and “looks forward to a DPRK positively engaged with the international community, showing respect for human rights and upholding its international commitments. This would help create an environment where further reflections on New Zealand policy towards the DPRK can be made”. Relations between North and South Korea have been especially tense since the sinking of the ROK naval ship Cheonan in March 2010, and North Korea’s shelling of Yeonpyeong Island that November. An international investigation concluded the sinking resulted from a DPRK torpedo (the DPRK has denied this), and New Zealand has responded. Foreign Minister Hon. Murray McCully in May 2010 expressed grave concern. He urged the DPRK to “refrain from further destabilising acts”, and to “refocus its efforts towards peace and dialogue”. New Zealand would support the ROK and others in “considering appropriate responses that encourage stability on the Korean Peninsula”.12 In July 2010 Prime Minister the Rt. Hon. John Key reaffirmed his support for the ROK by condemning North Korea’s attack, and expressed his condolences to the bereaved families. He reiterated New Zealand’s on-going commitment to peace and security on the Peninsula, and support for efforts to achieve North Korea’s complete and verifiable denuclearisation.13 Rev Don Borrie questions the international investigation’s conclusions and New Zealand’s stance. 10 Minister of Foreign Affairs and Trade. 2001. ‘Historic diplomatic link with North Korea’, 26 March; and KCNA. 2001. ‘Diplomatic ties between DPRK and New Zealand opened’, 26 March. Accessed 19 May 2012. Available from http://www.kcna.co.jp/item/2001/200103/news03/26.htm#1. 11 New Zealand Government. 1999. ‘Winston’s comments hardly a class act’, 24 August; Question for Written Answer 14387 (2006); and Ministry of Foreign Affairs and Trade. 2010. ‘North Korea – Country information paper’. Accessed 19 May 2012. Available from http://www.mfat.govt.nz/Countries/Asia-North/North- Korea.php. 12 Minister of Foreign Affairs. 2010. ‘McCully condemns North Korean link to Cheonan sinking’, 21 May. The ROK Embassy in New Zealand believed that New Zealand’s response “was timely and adequate as well as useful, which is in line with the reaction from the international society”. Private correspondence with ROK Embassy in New Zealand, 27 May 2010. 13 Prime Minister. 2010. ‘Republic of Korea-New Zealand Joint Press Release’, 7 July. 14 Minister of Foreign Affairs. 2010. ‘McCully condemns North Korean attack’, 24 November. 15 Private correspondence with ROK Embassy in New Zealand, 24 November 2010. 16 New Zealand-DPRK Friendship Society. 2010. Society media release, 24 November. 17 ‘Eyes on N Korea regime’. 2011. Press, 20 December, p.3.